Buying a condominium conversion, rehabilitation or re-development is very different from buying a new construction condo in NYC. We’ll go over the special risks associated with buying a condo conversion or rehab in this article. What Is a Condominium Conversion? Should I Buy a Condominium Conversion? Is the Electrical Capacity Upgraded? Has Extra Space Been Created? Are the Windows and HVAC Correctly Installed? A condominium conversion, commonly known as a rehab or re-development, is an existing building that has been refurbished and legally divided into separate condominium units. The degree of refurbishment will vary depending on the project and should be subject to deeper due diligence by buyers. Condo conversion projects come in all shapes and sizes. A single family townhouse can be converted into multiple condo units, or a former school, church or factory can be re-zoned and converted to condominiums for residential use. The primary reasons to purchase a condo conversion vs a traditional re-sale or new construction are quicker closings and potentially better prices. A major benefit of buying a condo conversion in NYC is that closings may happen faster than a ground up new construction because the building is already in place. As a result, instead of having to wait months or even years for a brand new construction project to finish, you could potentially move into a condo conversion within weeks. 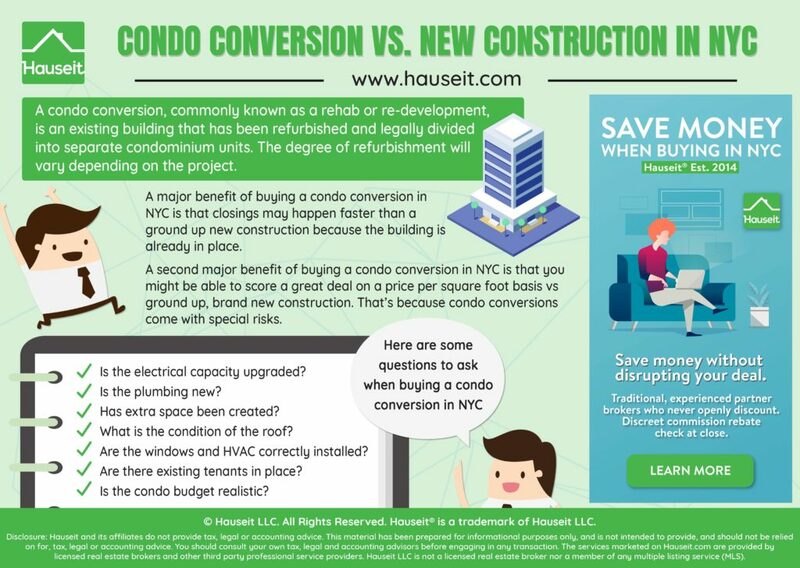 A second major benefit of buying a condo conversion in NYC is that you might be able to score a great deal on a price per square foot basis vs ground up, brand new construction. That’s because condo conversions come with many special risks which we’ll discuss in the following section. Lastly, a condo conversion may retain some of the charm of the existing building, especially if it is an architecturally interesting or even landmarked building. This may have a certain appeal to buyers who don’t wish to live in a modern new construction building. Sometimes condominium conversions will occur in buildings where there are still tenants in place. 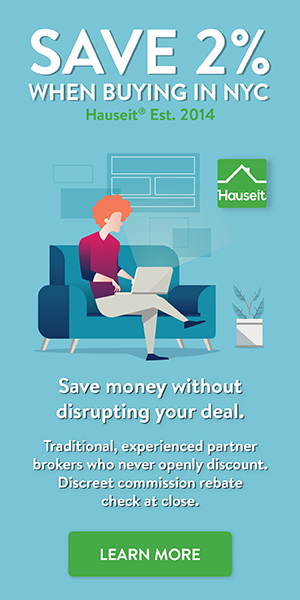 This creates another layer of complexity because a new condominium will need 50% of the units in a building to have signed contracts before the offering plan can be declared effective (i.e. if there is an “eviction plan” in place). This is significantly harder than the 15% requirement for new developments that have a “non-eviction plan” in place. The 50% threshold is much harder to hit if there are rent stabilized tenants in place or other tenants who refuse to vacate the premises. Pro Tip: Rent stabilized tenants in a condominium conversion can actually lower your property taxes. That’s because 10 or more unit condos or coops are assessed based on rental income and value. If some of the units are rent stabilized, that’ll reduce the building’s rental value and income and thus reduce property taxes for the building. This is also why some condominium conversions will have dramatically varying price per square foot sale prices for units within the building, and why some units will be renovated and others not. We’ll discuss in the following sections some special risks to buying a condominium conversion that you should pay special attention to. With that said, consumers are not entirely without protection from the NYC government. The city is quite good at inspecting certain things such as the electric wiring, primarily from a safety perspective. Inspections are supposed to happen before walls are sealed up. NYC is quite good at inspecting the steel skeleton, the pouring of the foundation and basic safety for electrical wiring. Essentially, NYC does do its job when it comes to basic safety. However, the below are items you should inspect for yourself to determine whether you’re getting a good deal. What is the amperage being delivered to the apartment? In the old days, builders got away with installing only 40 amps or so. However, 40 amps is hardly sufficient today with the plethora of electrical devices in the modern home. You may not be able to have the TV, microwave, lights, computers and air conditioner on at the same time with only 40 amps in your home. New buildings today will have 80 or even 100 amps as a standard. As a result, finding out what the amperage is for a condominium conversion will shed light on whether the developer did a full gut renovation vs a Botox job. If the developer did a serious rehabilitation, they will have ripped out the old 40 amp wiring and installed thicker 80 amp lines. If you don’t diligence this and end up having to install higher amperage later by yourself, you’ll have to pay up to replace all the old wiring in your walls. Furthermore, because cables become thicker as amperage increases, the old conduits may not even work. Rewiring can further be complicated by the fact that 80 amp lines are too thick to make sharp 90 degree turns like 40 amp lines and as a result you may need your new 80 or 100 amp lines to take a more rounded route through your walls. Needless to say, this can be an extremely unpleasant, costly and time consuming surprise down the road. Did the developer revamp the building’s pipes and plumbing? The most common reason for water leaks to occur in recently purchased condo conversions is that the plumbing was not actually new. If the developer only did a cosmetic refurbishment and didn’t replace the plumbing, then those 80 year old pipes may last only a couple of years before they start leaking again. Fortunately, a home inspector will be able to detect irregular moisture levels behind walls with an infrared device. Home inspectors can scan the apartment’s walls with a moisture meter to see whether moisture is present in straight lines (i.e. flowing normally in pipes) or if moisture is oozing out in all directions (i.e. leak behind the walls). Fortunately, this test can be done without having to touch the walls or pipes! Did the developer try to squeeze in extra space by opening up existing walls and putting new sheet rock up against the inside portion of the exterior walls? This is a terrible idea as there should be several inches of space for air flow behind the exterior walls. If there is no space for air flow, you’ll get the capillary effect which will cause any water to spread along the wall. Did the developer really refurbish the roof? What does “new roof” mean exactly when it comes to a condo conversion? The answer can vary dramatically depending on the project and sponsor. We’ve seen instances where a condo conversion advertised a new roof but failed to provide details for weeks. Finally, the sponsor produced a receipt from a local home improvement store for $150. A “new roof” in this case meant they spent a few bucks to put a new coat of tar on the roof! Pro Tip: If the roof is finished and has a wooden deck, make sure there’s a gap between the wood and the tar roof. That’s because tar will start to melt on hot days, and if there’s no gap the wooden deck will sink into the tar. Then when it gets cold that tar could freeze, in which case the deck is now meshed with the tar roof. Not only is this undesirable, this also presents a significant fire hazard! We’ve seen instances where the windows of a condominium conversion were installed so tightly that when you pulled them back, the rubber insulation came out with the window. These are all things you should thoroughly check at the home inspection. We’ve heard about instances where the HVAC units were wired backwards for a condominium conversion. Interestingly enough, all of this passed inspection by the city government. Pro Tip: A major bank headquartered in NYC told us that their official definition for a Full Gut Rehab is a building that has been “stripped to the shell” or skeleton, and that the electrical wiring and HVAC systems have been changed. Otherwise, a Non Gut Rehab is only considered to have undergone cosmetic changes. Be especially careful if you are purchasing a condominium conversion or even brand new construction in a smaller building. There have been way too many instances where sponsors of 6 to 8 unit condominium buildings have assumed a zero cost of labor in the condo budget. Essentially, they’ll assume that the owners are handy people and will take out the garbage and be janitors themselves. Is the Condo Budget Realistic? Then they’ll add a footnote that the owner may wish to hire a part time superintendent down the road. This obviously allows the sponsor to keep the common charges low for marketing purposes! However, it’s not just the zero cost of labor assumption you should be worried about in new development condo budgets. You should scrutinize how they back up all of their figures. For example, how good is the building’s master insurance policy? Less reputable sponsors may be inclined to buy the cheapest insurance policy possible to keep the common charges low for marketing purposes. Moreover, remember that buyers of new developments are expected to contribute anywhere from one to three months of common charges into the building’s reserve fund upon close. This working capital contribution can allow an artificially low budget to survive for many months before it is noticed by the new owners. Why would a sponsor sell a new development project as a co op vs a condo? Don’t they realize that condos will fetch a higher valuation? Sponsors are not dumb. The primary reason sponsors will choose to sell a new development as co ops vs condos is because they have a large existing mortgage on the building. Remember that coop corporations can take out debt much easier because they own the building and often the land as well. This is in contrast to condo boards which really only have the ability to leverage off of their taxing authority in the form of common charges. As a result, a sponsor could have a massive underlying mortgage on the building which they can then foist onto the new owners collectively. In fact, this underlying debt is actually added to the buyer’s consideration on a per share basis when the local government calculates the NYC Mansion Tax and Transfer Tax owed. Think about it this way. If I sell you a piece of my company for $5 (the equity), but you are also taking on $25 of debt (attributable to you based on your ownership percent), then aren’t you really paying $30? Remember that equity plus debt equals assets? And you are buying at the asset level when you purchase a coop apartment in NYC!